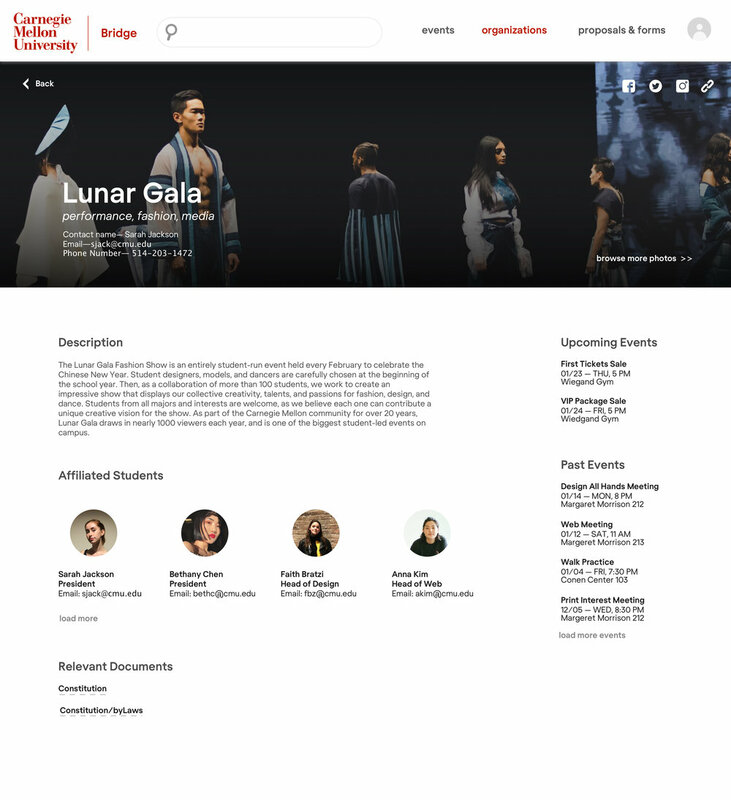 From research to execution, this project focuses on understanding the needs of new students arriving to Carnegie Mellon, and designing an experience for them to discover and propose new student organizations. This project is intended for my application to Google’s 2019 Design Internship. For those looking, thank you for your consideration. As new students arrive to CMU’s campus, they’re nervous and excited to start a new chapter in their lives. 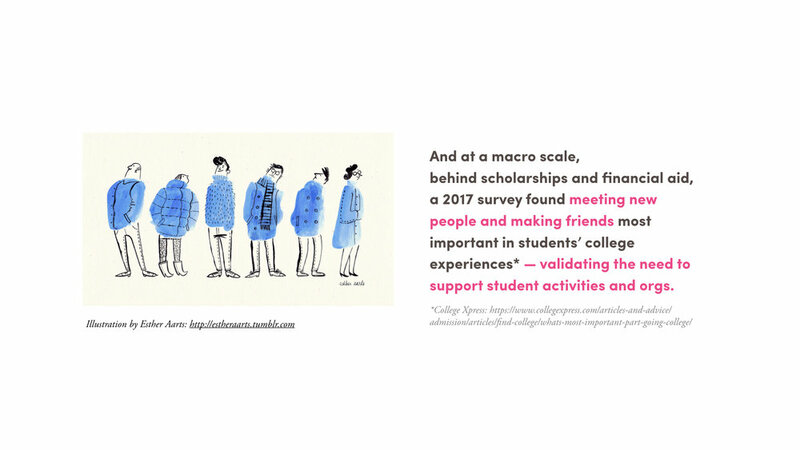 Most of these students are unfamiliar with their new school— and need an accessible solution to meet new people and learn about the school’s large catalogue of student organizations. 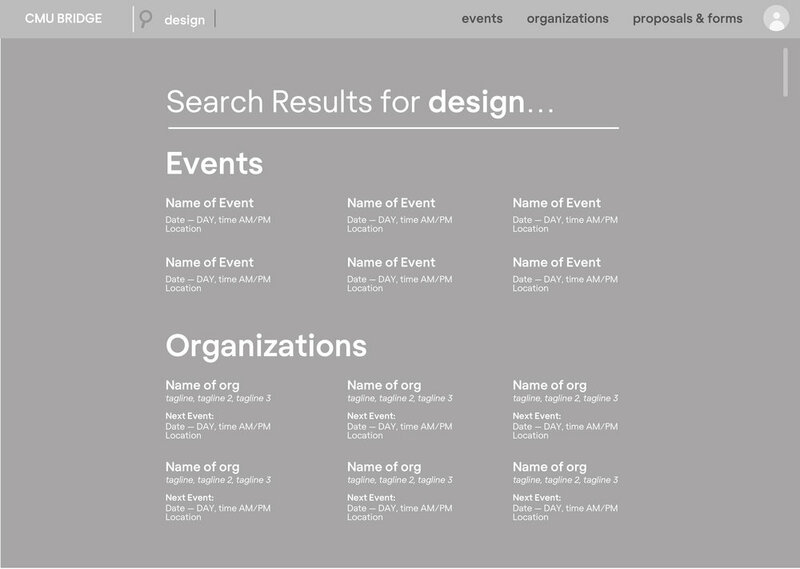 Design and experience for new students to browse, search, and propose new student organizations as they become familiar with their new school. Approaching this project, I wanted to conduct preliminary research to better understand its context. What are the specifics of my school I should keep in mind? What are the key points of accessibility? And how do I validate the intention of the project? By understanding these factors, I am able to better design for my specific user base, and approach the design with scale in mind. 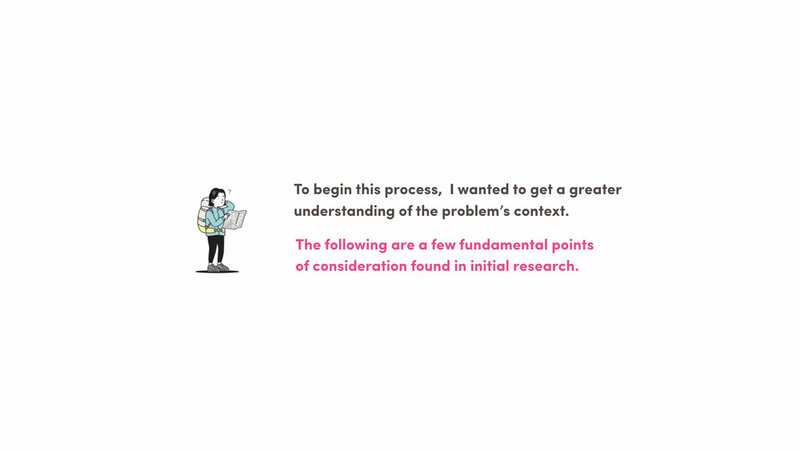 I conducted two different forms of research, interviews and task analysis, which allowed me to gather a large breadth of information in regards to current experiences of finding CMU Organizations. Through these interviews I was able to gain qualitative information for developing frameworks to guide my understanding of users, as well as gain insights nuanced to the experience of CMU. These interviews lasted approximately 20 minutes each, and were conversational in nature (using a set of questions as guidelines). 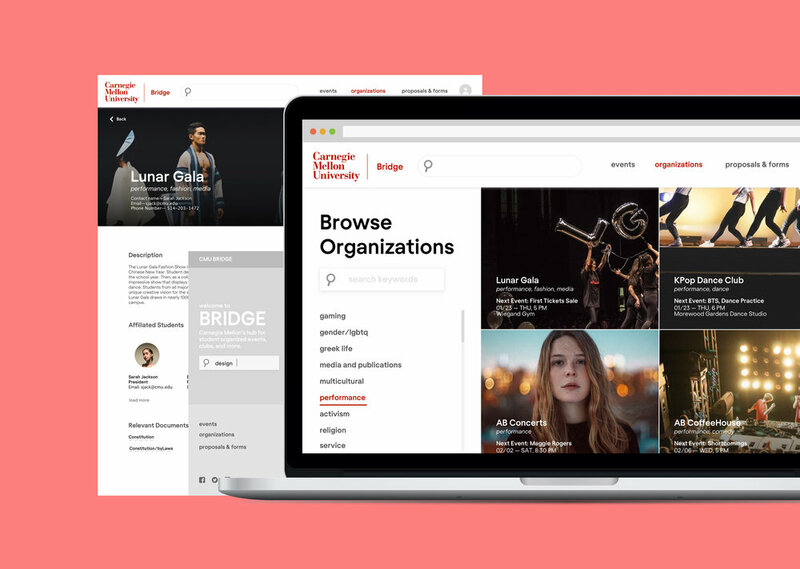 Bridge is Carnegie Mellon’s hub for categorized student organizations and events. 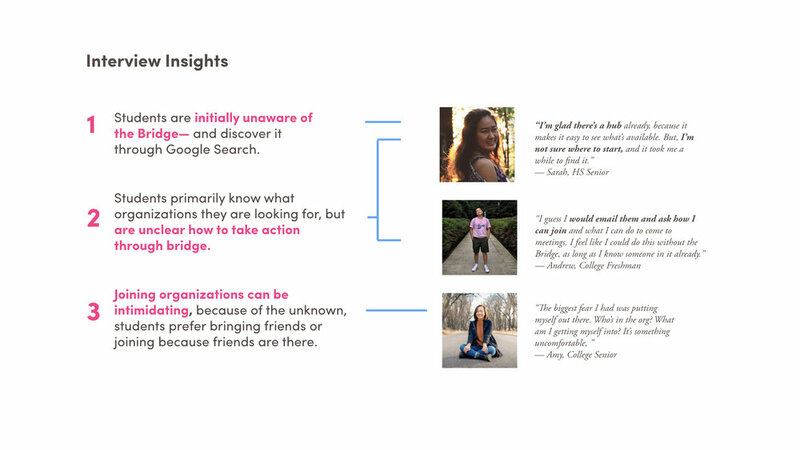 As a part of my research, I wanted to walk through and analyze the current experience— empathizing with what it may be like for a new student as they start their journey to discovering and browsing organizations. 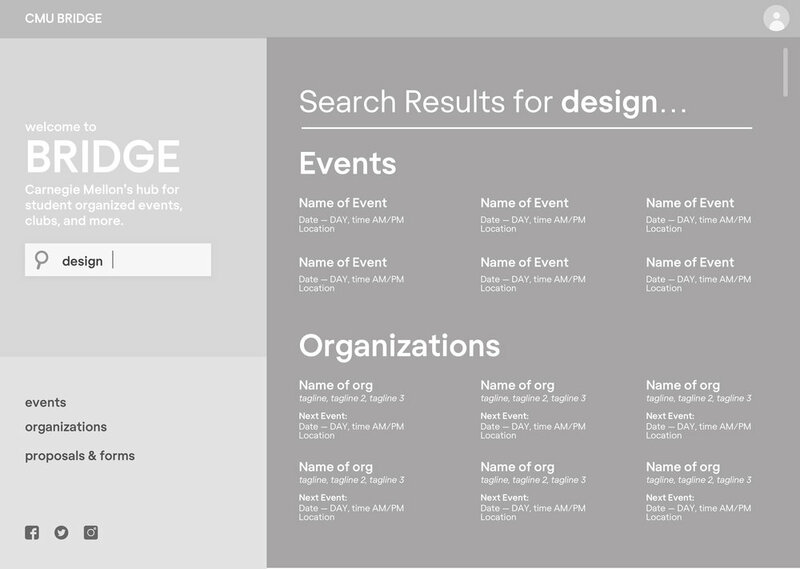 After consolidating research across interviews with students, as well preliminary research and current-experience research, It became increasingly clear the design of my final should take advantage of current student expectations of the CMU Bridge portal, and improve upon its experience. I finalized three key insights to inform my final design. The centralized hub of Bridge is convenient, but not considered a place students care to browse. Both in CMU’s web portal and in design, the hub should clearly indicate its purpose for students. 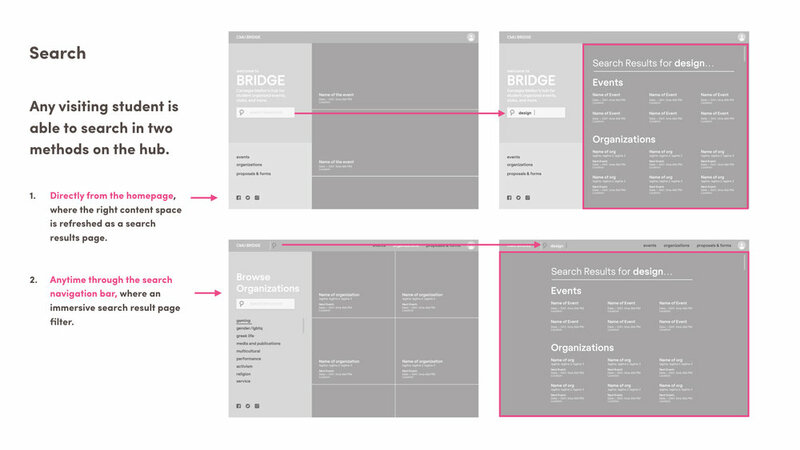 Bridge is an accessible platform to see organizations, but not take action. Actions available to students should take into account the variety of preferences students may prefer. The experience of Bridge still feels largely disconnected from the student population, and should prioritize engaging the student community holistically. Entering to find new organizations can be intimidating for those going in it alone. The breadth of organizations and events at CMU should be easily accessible and inviting. The portal is designed to emphasize experience and information— engaging visitors with content alongside clear text. By doing so, users can get a greater intuitive sense for the organization and events of the school— appealing to both the intimidated and the excited, the new and the old. Alongside this, hierarchy of text is refreshed across the platform to allow for immediate planning, decision, and action. 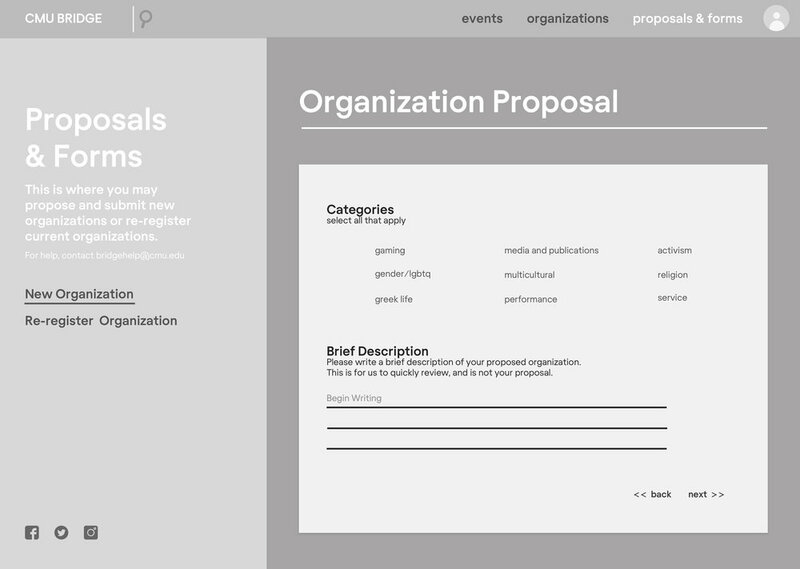 Next-Events are brought forward across multiple touch-points, contacting organizations on individual pages, and shareable links on social media even more accessible. 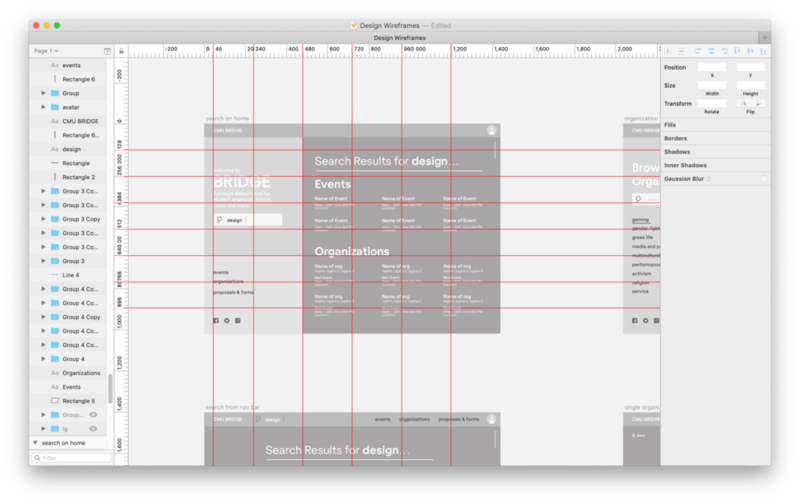 Designed in a 6X8 grid, the portal minimizes text sizes and emphasizes images over 2/3 of the window. This allows each composition to take advantage of content, and engage users with a greater sense of the CMU community.